Language differences are an asset. A cultural and economic asset. Today’s globalized world is an exciting place. We defend language diversity: nurtured correctly, it can be transformed into added value. Value for your business. SPEAK THE LANGUAGE OF ALL YOUR MARKETS: We’ve all experienced the frustration of buying an imported product only to find the instruction manual isn’t in our language. For example, although more than 70% of European consumers may be satisfied with their purchase, they find this “lack of consideration” annoying and would be unlikely to buy other products of the same brand. A VALUE FOR GLOBAL PLAYERS: Respecting local languages is indispensable for businesses targeting global markets. We handle the entire technical documentation workflow, from initial text drafting to printing. And it helps international organizations manage every aspect of their language requirements. Translations: Efficient translation services are essential for businesses and organizations active at the global level or engaged in international expansion programs. Our network of language and localization experts includes specialists in specific vertical markets and covers thousands of different language combinations and all alphabets. We deliver service levels to match specific client needs, from drafts for internal requirements to certified translations, using computer-aided translation (CAT) technologies, machine translation (MT) and post-editing machine translation (PEMT) when appropriate. We have the capacity to manage extremely large translation volumes and are committed to fully transparent processes providing the ideal combination of operating efficiency, quality, and cost. We offer outstanding competitiveness in technical translation work, notably in manuals. For each document we handle, our standard process consists of three stages: translation, editing, proofreading. Designed and implemented by our software experts, our Translation Management System is an “integrated system,” incorporating cutting-edge computer-aided translation tools, integrated workflow management systems, and quality control and customer care systems. Specifically, we employ the SDL Trados Studio, Global Client and Multiterm solutions, the Plunet Corporate Edition and QualityManager solutions, and the Dotsub Enterprise Platform solution. From management of a global multilingual site to production of manuals for users round the world, from production of marketing documentation for international audiences to software localization, our Translation Management System guarantees top-quality processes and rapid delivery at highly competitive prices. The goal of our Translation Management System is to cut companies’ project management costs. We interact with the client at each stage of the project: together, we analyze objectives and budgets, plan and monitor workflows, and share the results of copywriting, translation, and page layouts to guarantee additional cost savings on subsequent activities. Computer-aided translation technology enables our translators to create translation memories from previously translated texts and organize them into terminology databases with various access levels. The program recognizes the “text segments” in the database and presents the stored translation to the translator working on a new document. The translator can then accept, reject or amend the suggested translation. Text to be translated ex-novo is flagged by the program for immediate identification. As segments of new text are processed, the translation is fed into the database for on-going optimization. CAT technology delivers dramatic reductions in translation time and cost, especially on large volumes, technical documents or texts that require periodic update. Our Translation Management System incorporates a series of software applications such as InDesign, QuarkXPress, PowerPoint, to enable translators to overwrite text directly in the original format. This offers significant advantages: the time and cost of reviewing page layouts in the target languages are eliminated, and the client is no longer faced with the complexities of a four-phase management process (translator, graphics designer, proof reader, graphics designer). We provide efficient management of the main programming languages to facilitate complex localization projects such as globalization of websites and multimedia products or localization of software products. Our iterative, software-assisted process helps us to keep fine-tuning your messages and specific wording. 100% satisfaction or your money back! Interpreting: Interpretation is one of the most interesting and complex linguistic activities. In addition to sharing the client’s goals and expectations, a first-class interpreter provides and blends cultural references, playing a crucial role in the positive outcome of meetings and events. Our interpreter team covers any language combination to assist businesses and organizations anywhere in the world, at any time. High-precision profiling of the specializations available enables us to select the most suitable professional for the specific business situation or topic. “Transcreation”: The term transcreation refers to the concept of “creative translation”, a specialized localization activity for journalistic, promotional, and advertising material, or other sorts of documentation with a high creativity content. Our transcreation professionals combine the expertise of the translator and the skills of the copywriter with direct knowledge of the target market. Our job is to guarantee the integrity of the message in the target country by adapting its image, style and tone to the local context, while retaining the emotional impact and information content of the original. The presence of native-speaker professionals active in corporate communication (advertising, marketing, public relations) and direct monitoring of the main international marketplaces make our transcreation team a truly global market leader. Web localization: The ability to communicate with clients in their own language is critical for any international enterprise. This type of expertise is essential for success on the web, where businesses need to capture attention fast, with targeted messages and high-impact keywords, secure in the knowledge they will be understood instantly. Our approach to web localization (sites, portals, blogs, e-commerce, etc.) begins with a preliminary examination of the client’s characteristics and goals, the context, and the core values to communicate. Our services include context analysis, customized solutions, and specific content for each core market. Our native-speaker SEO copywriters deliver persuasive copy optimized for search engines in the original languages of the target market. Our teams work directly on the CMS (content management system) to deliver rapid updating of complex sites. Copywriting, technical writing: Turning out effective copy is a highly skilled task few people in the world of corporate communication have mastered. Good writing is not just a question of style and tone; it also depends on context, objectives, and tools. Moreover, in the digital age, writers producing copy for the web need to be familiar with a series of highly complex technical questions. These difficulties increase exponentially on multilingual projects. This is why we provide in-house training for its project managers and selects the best native-speaker copywriters, with the skills required for traditional marketing and communication, as well as for the new challenges on the web, social media, guerrilla and viral marketing. Our native-speaker technical writers offer specialist knowhow covering a vast range of vertical markets and are expert users of the authoring applications embedded in our Translation Management System. As a result, production of complex documentation is handled in an efficient, uniform manner, guaranteeing optimal quality and price. Moreover, for Google and the other search engines, your videos are invisible. Online video content is proliferating exponentially. By the end of 2015, video will account for more than 90% of internet traffic (source: Cisco Visual Networking Index). Every minute, 70+ hours of new video are uploaded to YouTube. The reason for this staggering growth is simple: video is a unique tool to channel emotions. Unfortunately, search engines are not equipped to index the “spoken” content of video. 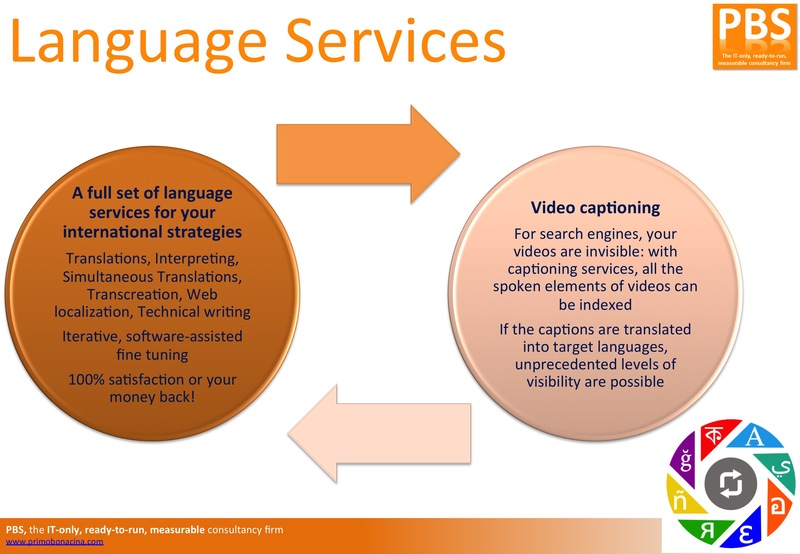 With captioning services, all the spoken elements of online videos can be indexed by search engines. If the captions are then translated into target languages, truly unprecedented levels of visibility and penetration are possible.